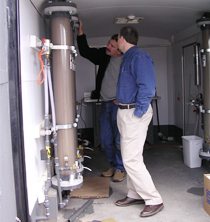 Pilot tests conducted at facilities across the U.S. consistently show that WRT treatment processes successfully reduce radium, uranium or other select contaminants in drinking water to well below the Maximum Contaminant Level (MCL). WRT can provide self-contained portable, free-standing pilot units or mobile, trailer-mounted units, depending on specific testing needs at each site. Services include unit delivery, setup and operating instruction. Upon completion of the pilot study, WRT will prepare a Pilot Study Report and a detailed cost proposal for a full-scale system. View additional Pilot Program information here. CORPORATE HEADQUARTERS | Water Remediation Technology LLC | 901 W. 116th Avenue, Suite 400, Westminster, CO 80234 | Phone: 303.424.5355 | ©2018 Water Remediation Technology, All rights reserved.